When designing a drain pan there are a number of different aspects of the drain pan requirement to keep in mind. The purpose of this resource is to highlight several of these “keep in mind” items for your next drain pan design project. Is your drain pan footprint large enough to do the containment job you need while fitting in the space available? Killarney Metals drain pans will have straight walls so the base of the pan will be as large as the top. This means that when design a drain pan the total area used by the drain pan will be as large at the top of the pan as at the bottom. If a piece of equipment like a washer or gearbox is going to sit in the drain pan make sure that the pan will hold the equipment. You want your equipment to sit flush on the floor of the drain pan without resting on the walls of the pan. When designing a drain pan make sure that you are clear on what side of the pan you would like the drain hole placed. This is particularly important if your drain pan sides are different lengths. You want the orientation of the drain hole and the drain pan to be as you intend. 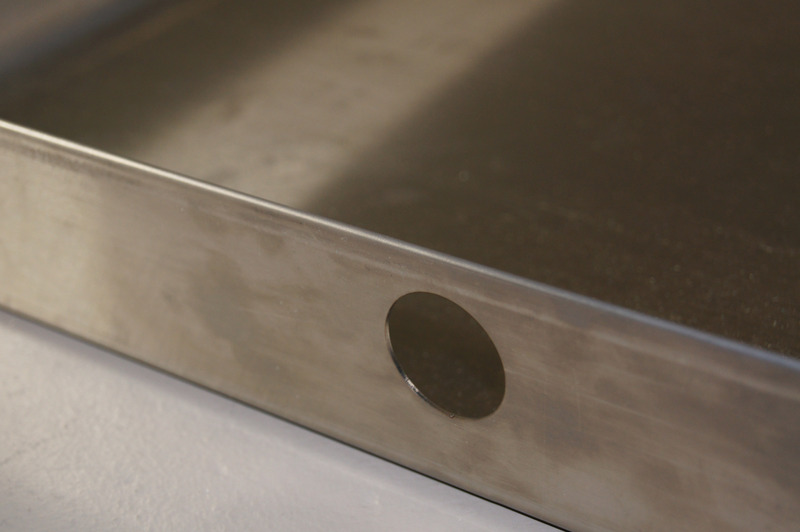 If you choose Killarney Metals to make a custom drain pan for your requirement, check the Production Drawing provided for your approval carefully before production to make sure that the drain pan is exactly as you desire. If you are designing a drain pan you will likely be draining the pan into something like a discharge pipe. Check the size of your fitting and make sure that it will work with the drain hole size you intend to put in your drain pan. You will want to make the drain hole slightly larger than the drain fitting and remember to account for the threading that will fit through the drain hole. Unless you intend to pump the contents of your drain pan out of the pan you will need to allow gravity to cause it to flow through the drain hole and down in the discharge pipe. Make sure when you consider the location of the drain hole in your drain pan that you have the height of the hole placement high enough to allow for the content to flow. For example, a washer drain pan with a drain hole lower than the height of the hole where the discharge pipe enters the wall will likely fill before the water is able to fill the discharge pipe. If the drain hole is higher than the discharge pipe than the liquid will naturally flow down the pipe as it reaches the drain hole level. We hope that you will find this drain pan design resource useful for your drain pan requirement. As always the experts here at Killarney Metals stand ready to help when needed. If you have any questions, please contact us at 704-981-1812 or email us at sales@killarneymetals.com. Visit our Drain Pan product page for more information – No Leak Guaranteed.